Guus Hiddink is expected to be used as an occasional advisor to Chelsea owner Roman Abramovich after losing his job on Tuesday as the manager of Turkey. The former Chelsea manager remains good friends with Abramovich and, while the Dutchman’s sudden availability will intensify outside scrutiny on manager Andre Villas-Boas, there are no plans for him to take on a formal position at the club. Instead, according to sources, Hiddink is likely to continue advising Abramovich on an informal and ad-hoc basis. Chelsea see no reason to make any public comment on the situation and, while nothing can be ruled out in the longer term, Abramovich is understood to be happy with the new managerial structure. Hiddink has a number of potential job offers waiting for him, although the prospect of a return to Chelsea as Director of Football working alongside Andre Villas-Boas is one of the more appealing. The Dutchman will not be rushed into making a decision and may even wait until the New Year to confirm any new position, although his comments immediately after Turkey’s 0-0 draw in Zagreb on Tuesday night hinted heavily at a move back to west London. 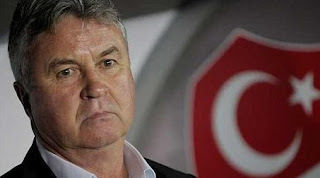 Hiddink did not travel with the Turkey squad back to Istanbul following their failure to qualify for the European Championships after a 3-0 aggregate defeat to Croatia in a play-off. A brief statement from the Turkey FFF said: “Following negotiations between the Turkey Football Federation Board of Directors and Guus Hiddink his contract has been terminated by mutual consent.